Above is the .pdf file for my latest pattern, the Donna Nobis Pacem Cowl – a si mple cable and lace pattern for a soft cowl. I made it for a fellow choir member, Donna, who had just been through a rough year and who was still trying to celebrate a birthday. 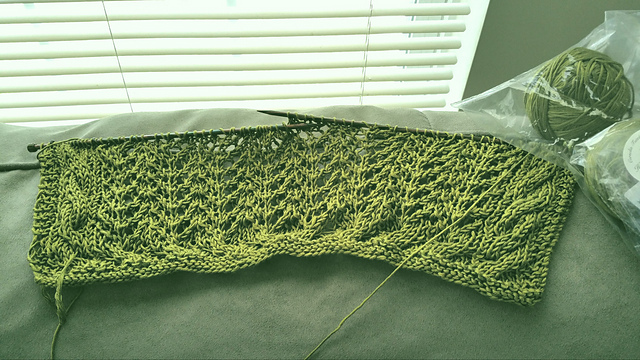 Above is the .pdf file for my new pattern, the Edging Scarf – a bit of a dabble into the world of lace. 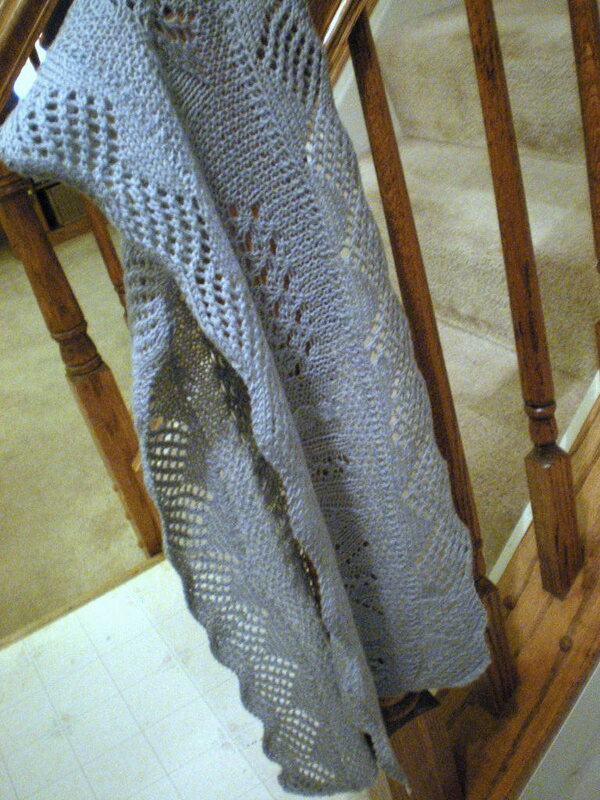 The scarf is about 2/3 edging – hence the name. NOTE: IF YOU DOWNLOADED THIS PATTERN BEFORE JULY 14, 2010, YOU WILL NEED TO DOWNLOAD IT AGAIN – I MADE A CORRECTION TO CHART B-RIGHT (WHICH IS ALSO CHART B-LEFT). THERE WAS A LEFT TWIST IN THE EIGHTH AND NINTH STITCHES OF THE CHART – ALL THE TWISTS IN THAT CHART SHOULD BE RIGHT TWISTS. OOPS! SORRY FOR THE INCONVENIENCE! And many thanks to NinjaGirl on Ravelry for pointing out the error:)! 7/14/10 – corrected the error! Found this stitch pattern in a much larger gauge in a sweater pattern on what I think was a blog in Portuguese – and found it so intriguing I though I’d just use it in a scarf pattern. Cast on 56 stitches (3 sts garter, 10-stitch pattern repeat X5, 3 sts garter) Or cast on any multiple of 10 plus six stitches. Repeat these 12 rows until you get the length you want, add fringe or finish as you like; wash, if necessary, block and wear:)! Directions: Use 16-inch circular needle. Cast on 100 stitches. Knit in k2p2 ribbing for approximately 2.5 inches. For the next 8 rows, knit all the knit stitches into the back (twiste d stitches), then back to K2P2 ribbing until length you wish – I knit another 10 rows or so. Use 3-stitch i-cord bind off. Use that for the bottom of the neck warmer. The twisted stitches cause the center rows to bow in just a little and twist ever so slightly. The yarn is also very soft and lovely to work with! I bought 2 skeins of the red yarn, but really only needed 1. For the orange, I don’t even think I got through 1/2 of the skein I bought, so if you have some yellow or orange in your stash, you probably won’t need to get another skein. It’s knit in the round – I use Magic Loop method, but you can use double pointed needles. Cast on 48 stitches. Knit K1 P1 for however long you want the cuff to be, then switch to just knitting every round. When you get to where you want to make the thumb gusset (in my case it was 28 rows), at the beginning of the round, P1, k in front and back of the next stitch (an increase), k1, k in front and back of the next stitch (another increase), P1. Knit the next round, except for those two purl stitches. Repeat those two rounds until you have 13 stitches between the two purl stitches. Knit the next round (2nd round in the pattern). Place the 15 thumb stitches on a stitch holder. cast on three sts (I usually turn the work, purl on three stitches, then turn the work again and continue the round. Go back to the 15 thumb stitches. Put them on the needle. Pick up five stitches. Knit in the round for about three rounds. Bind off. Use the first glove as a template for the second one. Knit about 10 rounds. Bind off. Thanks to Robin hrobin1 here on Ravelry from the Columbia Sip ‘N Knit for giving me to the impetus to write this up! Check back here in about a month or so and I will have a free pattern or two available – my own design or freely allowed by someone else and properly credited! 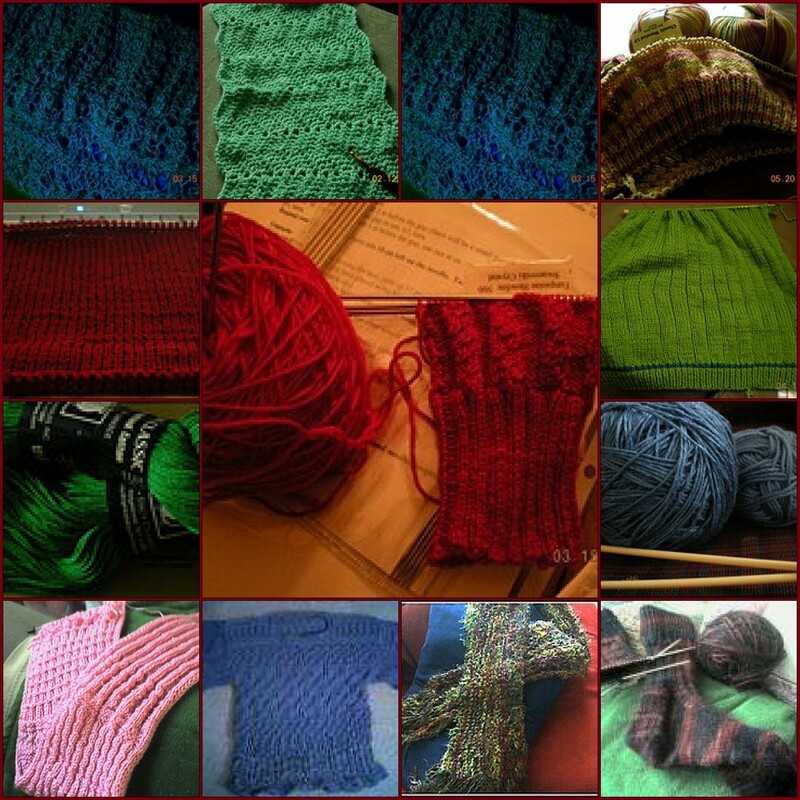 Until then….. you’re stuck with pictures of knitting past – mostly other people’s designs! Oh duh! Columbia, Merlin! Only where my DH’s corporate headquarters (or the headquarters of their subsidiary or something) is located. Why in the heck didn’t I notice that earlier??? If he ever has to go there, I’m dumping the kids with their Grandma and tagging along. I wanna sip & knit! Absolutely! You’ve got to do it! Please – that would be amazing! having such an intereseting blog like you, you should know that it is a must to offer a cup of coffee for the readers… and since its Saturday evening.. a glass of wine would do too..
HAHAHa! Definitely a glass of wine – especially fuer die Europaischen!! Quick question on “scarf Mit Faux Cablels:” Row 11, a right side row, appears to be repeating the even-side rows, rather than resembling the odd side rows that preceded it. Is this correct? No, Row 11 is K3* P1, K9, etc., whereas the even numbered rows are K3 *P9, K1,etc. I just downloaded the cowl pattern and can not make the first pattern row come out to 66 stitches – I keep getting 69. Could there be a mistake?